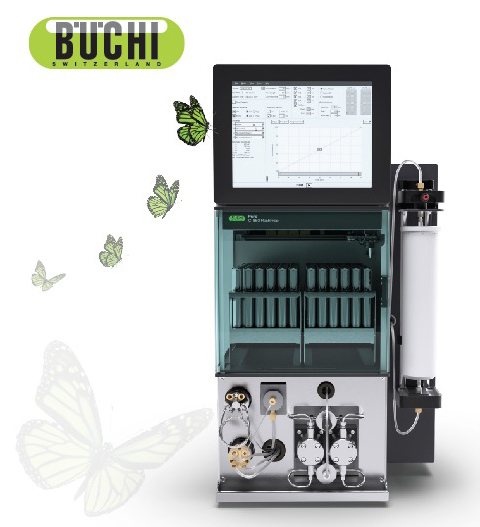 The new Buchi Pure flash and prep chromatography systems, designed to get more purification into less space while offering maximal protection for the user, their samples and the environment is exclusively available in Southern Africa from Labotec. The chromatography equipment can be used for the purification of high value compounds, while offering the high flexibility needed to satisfy any customer requirement. Pure distinguishes itself by numerous state-of-the-art technologies to protect the lab staff, their research and the environment. Some of these safety features include a closed fraction collector bay, which ensures clean air in the laboratory, as well as vapor and pressure sensors which assist in the safe operation of the system. Remote control of the platform lowers exposure to hazards in the laboratory. Despite its compact size, the Pure instrument offers numerous features for an optimized technical performance, such as integrated UV and ELS detection and flash and prep HPLC capabilities all in one system. The operation of the Pure instruments is highly intuitive and convenient and therefore makes chromatography accessible to everyone. The software interface follows a proven logic, the integrated ELSD technology is user-friendly and the sample injection is universal. Furthermore, all important parts are easily accessible for cleaning or maintenance purposes. The BUCHI consumable portfolio matches the diversity of customer requirements. A wide range of high quality products, such as flash cartridges, prep HPLC columns, glass columns, TLC plates and several solutions for liquid and solid sample loading can help optimize any purification workflow. With the new Pure instruments and consumables BUCHI offers a one-stop solution for flash and prep HPLC chromatography that is safer, cleaner and more efficient. This entry was posted in News and tagged Buchi Pure flash and prep chromatography system.